US investigators believe that Syrian-born Mohammed Haydar Zammar recruited Mohammed Atta - the suspected ringleader of the 11 September suicide attacks. Zammar, a German citizen, was arrested in Morocco after he left Germany in the wake of the attacks. Moroccan authorities later sent him to Syria. Zammar is believed to have been in Hamburg with Atta and other members of Atta's cell - including hijackers Marwan al- Shehhi and Ziad Jarrah. German authorities have said they interviewed him after the 11 September attacks. 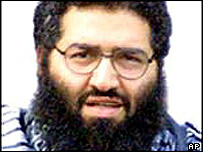 Mohammed Haydar Zammar, (one of the organisers of the 9/11 attacks) was there. This is where the Syrian part of ISIS was born,” he said.